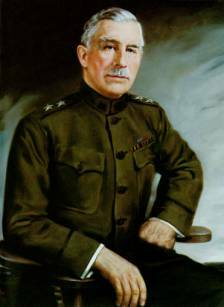 Leonard Wood was born in Winchester, New Hampshire, on 9 October 1860. He was educated at Pierce Academy in Middleboro, Massachusetts. He then attended Harvard Medical School and received his doctor of medicine via an internship at Boston City Hospital in 1884. The next year, he received an interim appointment as a contract surgeon with the Army, then an appointment as an assistant surgeon in the regular Army. Wood fought in the final Indian Wars and earned a Medal of Honor for his conduct in the Geronimo campaign. In 1890, he married Laura Condit Smith. In 1891 he was promoted to captain. Four years later, he was made assistant attending surgeon in Washington, D.C., responsible for the care of senior government officials, including the president. In 1898, he was made a colonel in the 1st Volunteer Cavalry (the Rough Riders) and led it in its Cuban operations, including at San Juan Hill. Later that year, he was made a brigadier general, and then a major general, of volunteers. After the Spanish-American War, he was transferred to the Philippines and served as the governor of the Moro Province from 1903 to 1906. Later, he commanded the Department of the East and served as a special ambassador to Argentina to celebrate that country’s centennial birthday. From 22 April 1910 to 20 April 1914, Wood served as the Army Chief of Staff. He was a leading proponent of national preparedness, streamlined Army administrative procedures and urged increases in officer strength. After his tour as Chief of Staff, Wood once again commanded the Department of the East from 1914 to 1917. He trained the 10th Division at Camp Funston during World War I. Later, he ran unsuccessfully for the Republican nomination for president in 1920. He commanded the Central Division from 1919 to 1921 and then served on a special mission to the Philippines in 1921 before retiring from active service. Wood was the governor general of the Philippines from 1921 to 1927. He died in Boston, Massachusetts, on 7 August 1927.